The first thing to understand about mold is that there is a little mold everywhere – indoors and outdoors. It’s in the air and can be found on plants, foods, dry leaves, and other organic materials. But, when it is growing indoors anywhere it is a problem. It’s very common to find molds in homes and buildings. After all, molds grow naturally indoors. And mold spores enter the home through doorways, windows, and heating and air conditioning systems. Spores also enter the home on animals, clothing, shoes, bags and people. When mold spores drop where there is excessive moisture and a suitable food source, they will grow. Common problem sites include humidifiers, leaky roofs and pipes, overflowing sinks, bath tubs and plant pots, steam from cooking, wet clothes drying indoors, dryers exhausting indoors, or where there has been flooding. That was important – let me say this again. If you have a water loss or a water event and it’s not properly cleaned and dried within 24-48 hours, you stand a good chance to have some type of growth. Now, water events or losses come in many forms. Let’s look at a few: Leaks, floods, poor flashing, poor ventilation, high levels of condensation, high levels of relative humidity. You get the point. The main thing to remember is to dry everything as fast as you can. The building materials and internal material of buildings provide suitable nutrients for mold, helping it to grow. Such materials drywall, include paper and paper products, cardboard, ceiling tiles, wood and wood products, dust, paints, wallpaper, insulation materials, carpet, fabric, and upholstery. 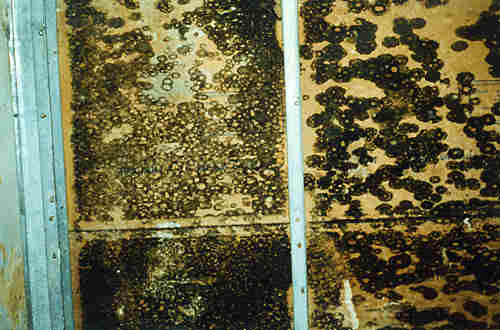 There’s been a great deal of information regarding indoor mold throughout the country in the media and advertising. The end result is a groundswell in concerns form homeowners and buyers. It’s common to find mold even in new homes. Everyone is exposed to some amount of mold daily, most without any apparent reaction. Generally, mold spores can cause problems when they are present in large numbers and a person inhales large quantities of them. This occurs primarily when there is active mold growth or when infestation is improperly handled, causing mold spores to release and become airborne. Yes. All Pro Home Inspection can collect air, swab and bulk samples. All samples are sent to a lab for analysis and an easy to comprehend report will be emailed to you directly from the laboratory. Air samples are taken indoors and outdoors to determine whether the number of spores inside your home is significantly higher, or if there is an unusual mold condition present. Swab and bulk samples simply state weather or not mold and mold spores are present of the sampled area. First address the source of moisture that is allowing the mold to grow. Then take steps to clean up the contamination. Below is a helpful link to lean more about cleaning up mold in your home. The general rule of thumb to remember is to have a trained professional complete any remediation when growth is over 10 square feet. Improper remediation from an untrained person can cause cross-contamination and multiply the problem and cleanup expense. For additional information regarding moisture and mold please visit – “Mold and Moisture“, Environmental Protection Agency.